Plan your layout: Before you start moving your furniture, look over your space and consider how the room will function: what’s the main purpose? will it host lots of guests? Is it a personal space? How will foot traffic need to flow through the room? Answering these questions will help you decide which types of furniture will work best. Choose a focal point: Pick a focal point in the room, whether it’ll be where the television will be, a fireplace or a large window, and arrange your furniture around the room. Remember to plan for and guide foot traffic around the furniture. 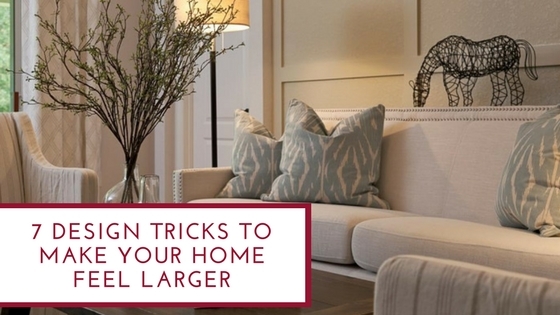 Scale your furniture: Most people assume that smaller furniture works better in an equally small room, however, many interior designers recommend choosing one large statement piece (a sofa or bed) and then filling the space with smaller pieces (chairs, nightstands, etc.). This method allows you to furnish a room without looking cluttered will multiple smaller pieces. Be sure the furniture does not block walkways or natural light. To help cut down on the number of furniture pieces, consider multifunctional pieces that can fit an additional need or provide extra hidden storage. Play with angles: Conventional wisdom is to push the furniture against the wall to create space but floating your furniture a few inches in front of the wall is a better use of space! Placing your furniture just a few inches away from the wall can help make the room look more open. Also experiment with angles and arrange some of your furniture diagonally. Paint with lighter colors: Darker colors can make a room appear smaller because they absorb light instead of reflecting it. That’s why it’s better to stick to lighter colors like white, pale grays and blues, to create a light, airy feeling. Reflect the room: Want a quick way to make a room appear larger? Strategically place a mirror opposite a window to reflect the light and the view, which will trick the eye into believing the room is larger. Light it up: Don’t rely on just the overhead lights to light your room. Spread the light around the room with the use of several smaller lamps. This will draw the eyes around to the different spaces of the room as light fills more dark areas.